This is a dilemma most people face when they get serious about photography. The truth is that no matter if you want to pursue it as a hobby or you think of going professional, the tools of this craft will set you back financially. So it’s very important to make the best decisions for your budget. The most crucial question you have to ask yourself before you go shopping is what kind of photography you want to pursue. In the long run, that will dictate the direction of your purchases. You’re looking at different gear for portrait photography compared to stock or product. Here are a few guidelines to help you make the right call. Keep in mind, contrary to popular belief, the camera itself is probably one of the least important parts of you gear. Regarding camera brands , you’re pretty safe buying from any major brand like Canon ,Nikon, Pentax, Sony, etc. Camera development has come a long way and most of today’s imaging products offer fantastic image quality. A budget of $2k will buy you some pretty good stuff, but it can also buy a cool, full frame camera body with a mediocre lens. Don’t follow that path just for the sake of having the cool, expensive camera to show your friends and family. 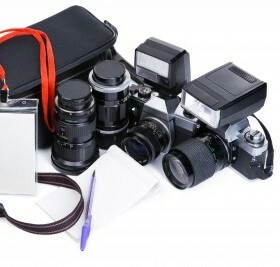 Instead, you might consider buying an advanced consumer camera like the Nikon D7000 or the Canon 7D with a standard kit lens, and build everything from there. This will set you back about 1200$. The best tools for portrait photography are prime lenses. They are fast, well built and great for obtaining blurred backgrounds and sharp details. The most commonly used focal lengths are 35mm, 50mm, and 85mm. Each of these lenses, from most manufacturers, come in two f-stop versions :1.8 and 1.4 .The differences are quite noticeable in terms of built quality, speed, working in low light situations and, not to mention, price. Since the 1.4’s are way over our settled budget, we’re left with two remaining options. You can either buy two 1.8 prime lenses or, and this is where my money would be , buy a beginner’s light kit and one prime lens. I would recommend the 85mm for better bokeh and detail in most cases. It gets simpler if you want to take on fashion photography. For this budget I would get the most affordable entry level camera with a kit lens and spend the rest on the best lighting solutions available for the money. Fashion and glamour photography are about dramatic, well placed light so an expensive camera with a great lens would help you, but would also limit you to natural light. Whether it’s weddings, corporate events or press conferences, you need to have a decent kit to face any unexpected challenges .I would go for the advanced consumer body and a fast, all round zoom like this Tamron. Also , the one piece of equipment you don’t want to forget about when doing event photography is the external flash. It can get pretty dark in churches and conference rooms, so put this one at the top of your list. A long, fast lens is the most important part of a sports photographer’s kit. While most of them are out of this price range, there still are a few good options like this long zoom. Combined with a prosumer body that can provide 5fps or higher, with a little practice you could get some great, frozen action shots. Landscapes are about a wide visual perspective, so a quality wide angle lens is what to look for. Since speed isn’t very necessary in this genre, you could either go for an entry level body as well as a more advanced one. Keep in mind though, some of the most important accessories for landscape photography are filters , so you might want to put some money aside for those. This is a niche that has it’s own tools .You will need a good close-up lens, with a preferable 1:1 reproduction ratio. Controlled lighting is also very important so look for a product tent and some backgrounds. You should also consider a product table with a reflective surface for a commercial look. These are just some recommendations. In the end , it’s up to each of us to decide what the best options are for the budget. Don’t forget though, technically, the best long term investments you’ll make are not cameras, but rather quality lenses and good lights.